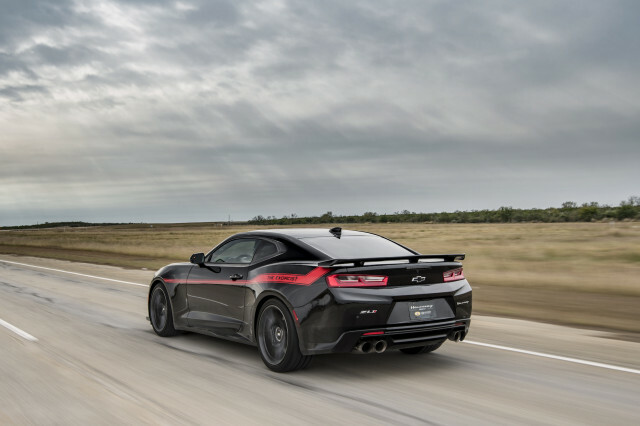 You can bet Hennessey Performance Engineering had one figure in mind when developing the Exorcist Chevrolet Camaro ZL1: the Dodge Challenger Demon’s 9.65-second quarter-mile time. And it’s not a surprise HPE was able to top the 9.65-second time with a 9.57-second quarter-mile run. Hennessey released video evidence of the run in a YouTube video, which shows the Exorcist Camaro rocket down the drag strip and clip 147 mph. As a refresher, the Exorcist Camaro hits 60 mph in 2.1 seconds and 100 mph in just 4.7 seconds. All of those figures trump the Dodge Demon, though the Demon accomplishes its accolades with 840 horsepower. The Exorcist Camaro packs 1,000 hp at the crank; 959 hp makes its way to the rear wheels and the car will top out at 217 mph, thanks to a higher flowing supercharger and intercooler system, which is dialed in to produce 14 psi of boost pressure. Despite all the anti-Demon talk, HPE will get its hands on the Dodge Demon in the future, and we’re certain it will come up with some massive performance package to more than likely outdo its own Exorcist Camaro. But, the Demon is, after all, a factory vehicle and Dodge backs all of its impressive marks with a 3-year/36,000-mile vehicle warranty, and a 5-year/60,000-mile powertrain warranty. Customers will be met with a starting $117,135 price for their own Exorcist Camaro, which includes the price of a donor Camaro ZL1. However, that’s not before an optional drag package or road-race pack. An automatic transmission also costs $9,950 extra. TechRadar's 2017 CES Awards – take our People's Choice poll!